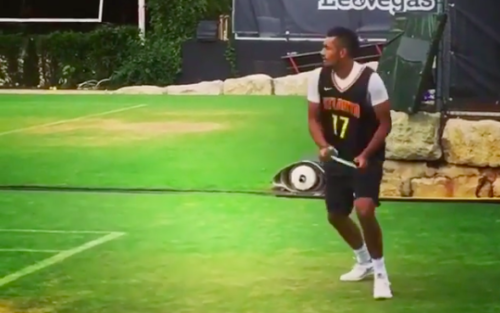 Nick Kyrgios and antics go hand-in-hand, one may say. So, what he has done now hardly comes as a surprise. The volatile Australian tennis player, who is competing at this week’s Mercedes Cup in Stuttgart, hit some backhands with the racket upside down, much to the amusement of some spectators. Kyrgios later took to his official Instagram account to share a video from his training with his 876,000 followers. “Obviously not playing tennis at the tennis courts but repping @ds17_fg in Germany #ballislife #Schroder,” he wrote. However, there was one person who was not amused at all with Kyrgios’ capers (well, take it with a pinch of salt). Andy Murray, who doesn’t shy away from showing off his humours side on social media, was at it again. “This is the reason we only hit together once,” the Brit wrote along with a couple of laughing emoticons. This is not the first time Murray has trolled Kyrgios on Instagram, having poked fun at the latter’s biceps earlier this year.